Light up your vehicle with this low-profile, wide-format, extra-bright safety light bar. Upgraded optics on this light bar meet SAE Class 1 specifications while maintaining a low profile for reduced wind resistance and aesthetics. The Low Profile LED Safety Light Bar measures 48" across and only 3 inches high providing a very wide coverage area for your vehicle while the mounting legs only add 1 inch to the height. The housing is made from durable, yet lightweight polycarbonate and aluminum. 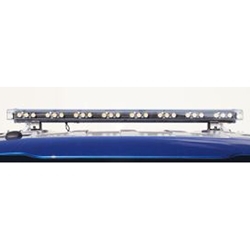 This light bar includes 24 SAE Class 1 LED lights available in Amber, White, Red, Blue or Green with a user-selected flash pattern. Installed Measurements: 48" x 8" x 4"